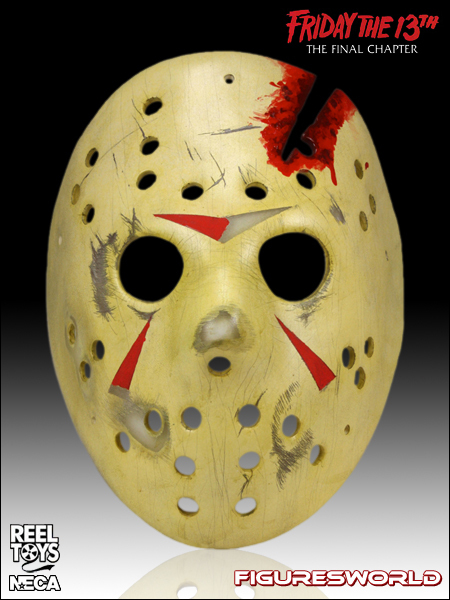 For the first time ever an affordable replica is available of the hockey mask worn by Jason in Friday the 13th Part 4: The Final Chapter. Made from resin and hand painted, includes leather-like straps so you can wear the mask or hang on the wall for display. Includes the cracked battle damage wound with bloody deco!! Accurate to the film in every way! Blister Packed! You gotta figure that after four movies of dying, dying, more dying, lots of killing and more dying, Jason’s going to be a little beat up, right? NECA's The Final Chapter mask replica shows some more scuff marks than its Part III counterpart and has the gaping crack of a headwound. Rest assured, this mask is plenty sturdy in addition to being a recreation of Jason’s in the fourth movie.